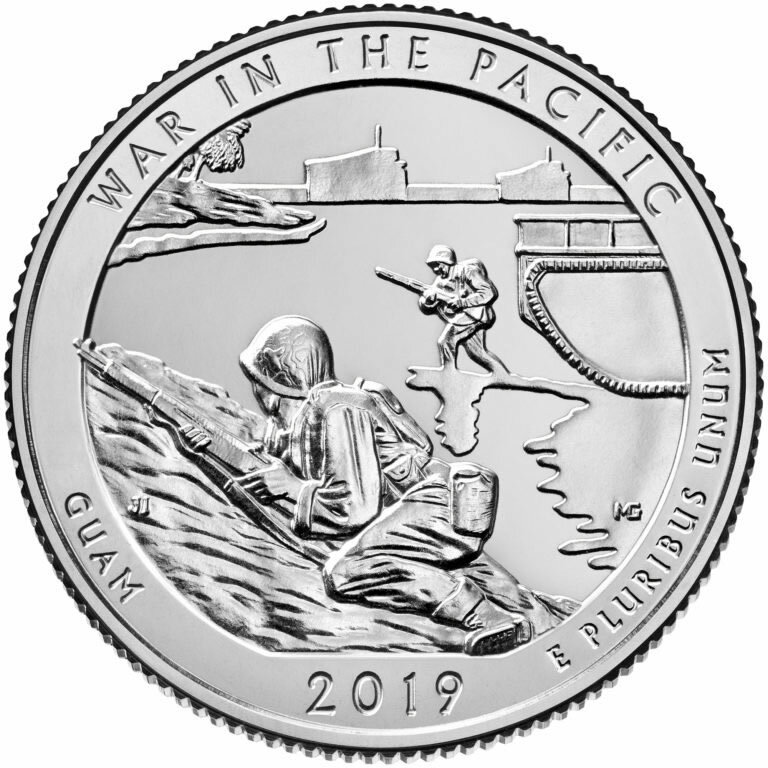 The United States Mint published images and release dates for the five 2019 quarters that recognize four national historical parks and one wilderness respectively located in Massachusetts, Northern Mariana Islands, Guam, Texas and Idaho. 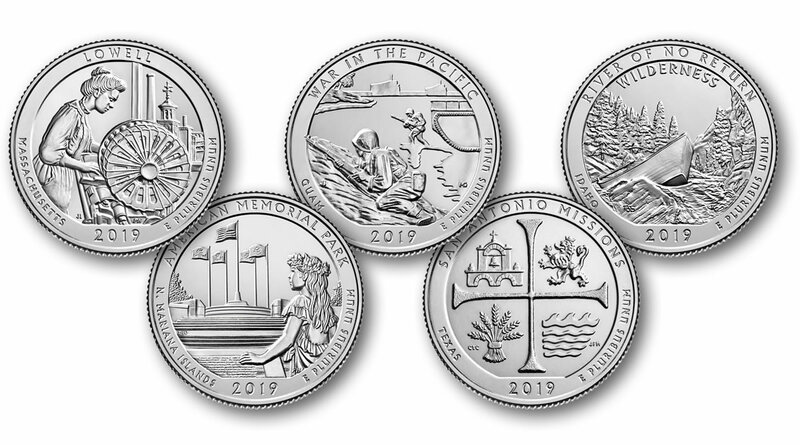 They represent the 46th through 50th coins from the U.S. Mint’s program of America the Beautiful Quarters®. 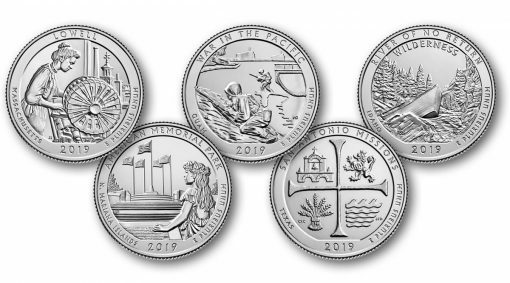 The series calls for one quarter celebrating a site in each of the 50 states, the District of Columbia, and the five U.S. territories. A combined 56 sites will be honored by end of the program in 2021. Feb. 4, 2019 – Lowell National Historical Park in Massachusetts. 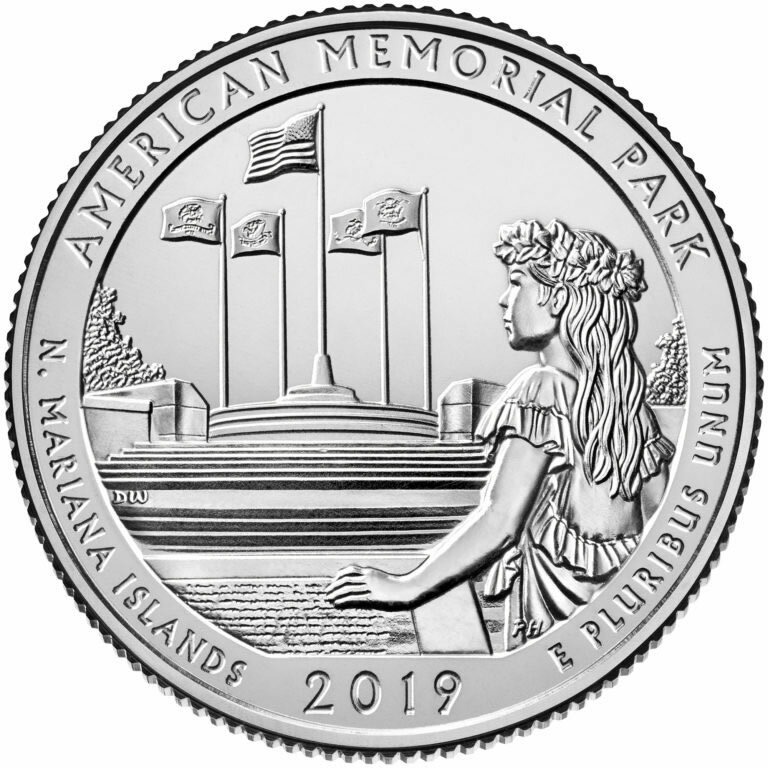 April 1, 2019 – American Memorial Park in Northern Mariana Islands. June 3, 2019 – War in the Pacific National Historical Park in Guam. Aug. 26, 2019 – San Antonio Missions National Historical Park in Texas. 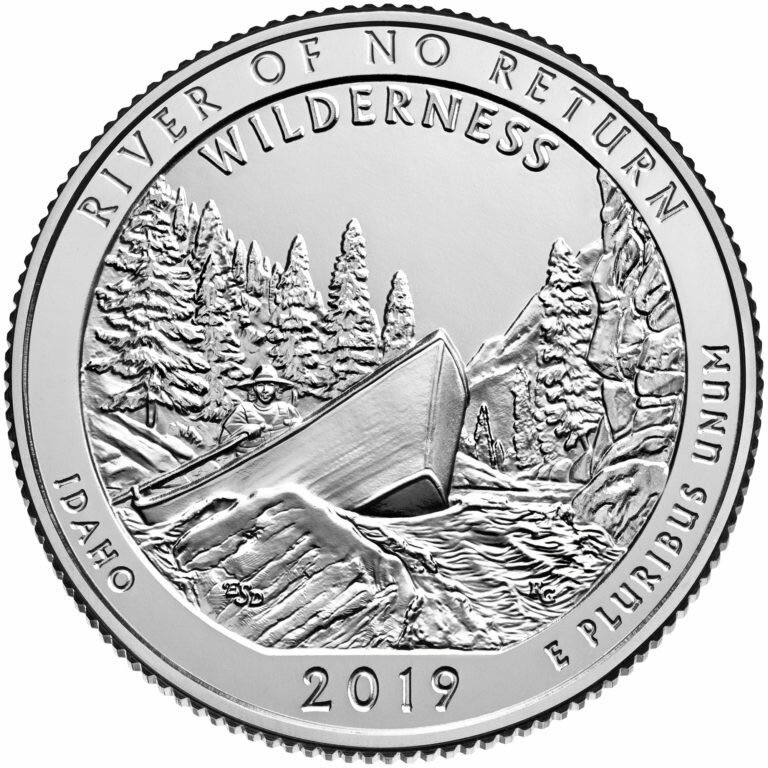 Nov. 4, 2019 – Frank Church River of No Return Wilderness in Idaho. 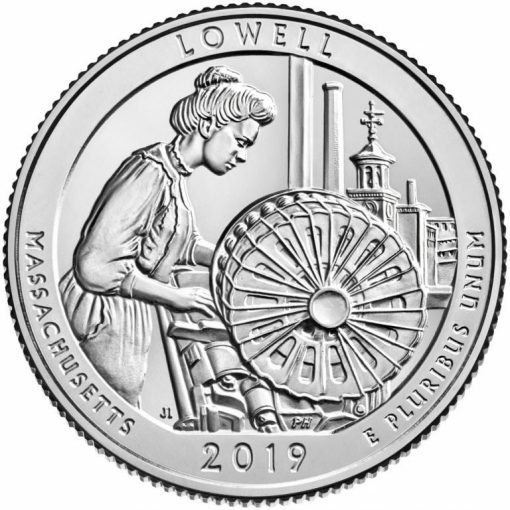 The U.S. Mint unveiled line art images for these quarters in August, describing their designs and disclosing the artists who created them. More than six dozen candidate designs were in the running before the final five selections were made. proof versions in annual sets. 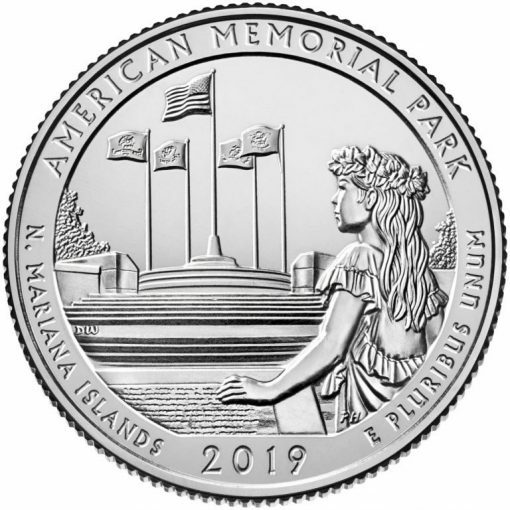 The U.S. Mint will also use the same designs on companion bullion and collector coins that are composed from five ounces of 99.9% fine silver and struck to a diameter of 3 inches. CoinNews will talk more about these larger coins and each new quarter product when they become available. U.S. Mint-published images and brief descriptions of the five designs appearing on the reverse or tails side of the quarters are presented below. The design depicts a mill girl working at a power loom with its prominent circular bobbin battery. A view of Lowell, including the Boott Mill clock tower, is seen through the window. 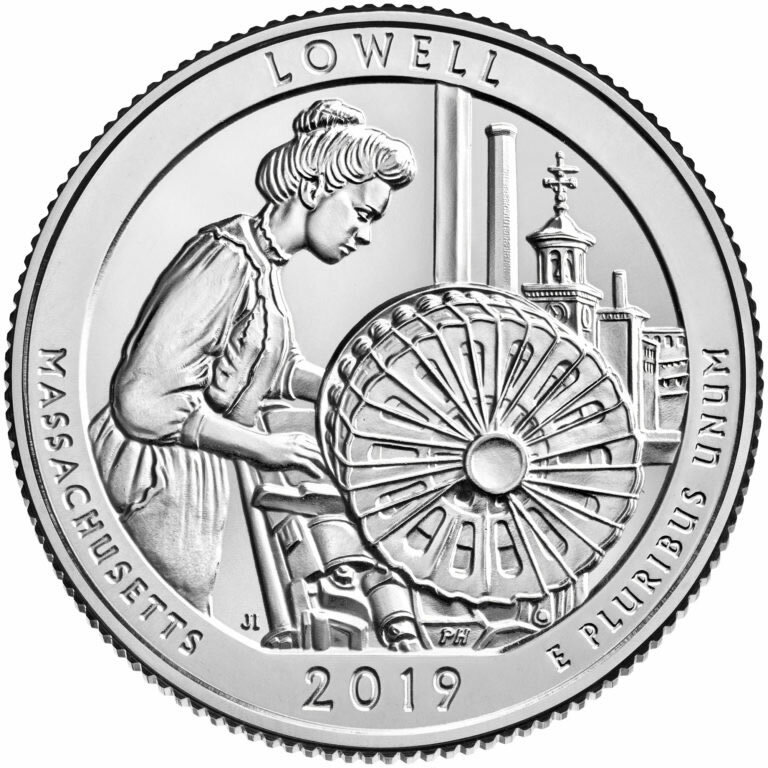 Inscriptions include "LOWELL," "MASSACHUSETTS," "2019" and "E PLURIBUS UNUM." America the Beautiful coinage share the same obverse design, a portrait of George Washington by John Flanagan. This image has appeared on quarter-dollars since 1932. The portrait underwent digital enhancements in 2010 to bring out more of the beauty of the original model. 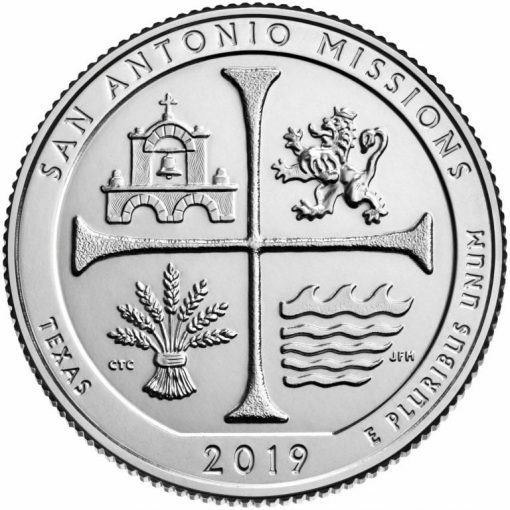 As a Texan, I’m disappointed that we won’t be represented by a detailed still image like every other coin thus far in the series. The Alamo is pretty recognizable, and is the most well known mission, why isn’t it depicted?